Watercolor Wednesday – You’re Gonna Love This One! Oh me. I amaze even myself in my magnificent glory. I am quite the looker. I know, I know, it’s all about me. Yes. It’s as it should be. I’m a Scottie. That’s the way we roll. It’s Wednesday. Time for some StuART. And here’s my latest example of cul-cha in the artistic vein. Every Wednesday I try to share a little art. A little some’in special. So, if you’re just joining us, please be sure to come back. Often. And, if you’re a loyal friend, I thank you. I do all of this for you. Don’cha know. REALLY? Who am I kiddin’???? No, really, I do love you. You’re my pals. 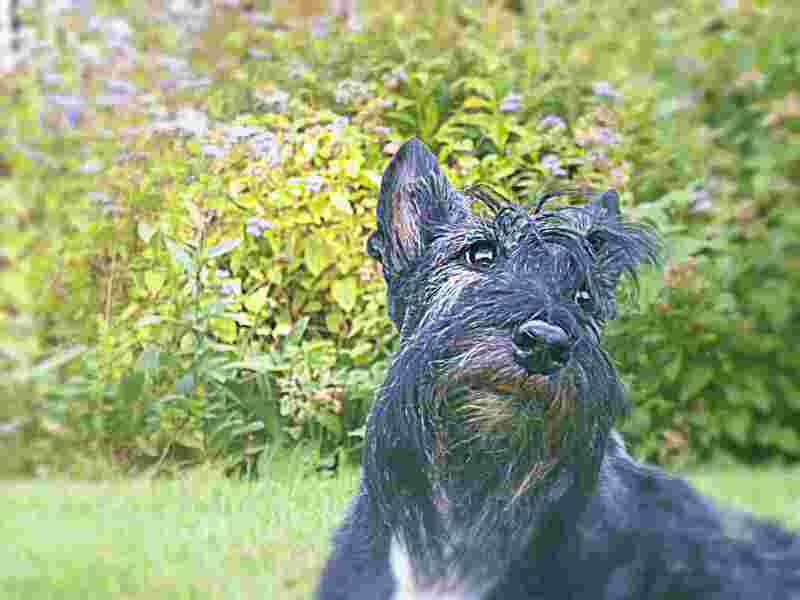 This entry was posted in dog art, The Scottie Chronicles and tagged art, dog art, paintings, photography, Scotties, The Scottie Chronicles, watercolors. Bookmark the permalink. 17 Responses to Watercolor Wednesday – You’re Gonna Love This One! That is indeed a gawjuss picture, Stu! It’s your expression that really does wonders. You must be southern….’cause that’s JUST how We say it: GAWJUSS! VERY cool photo of you Stuart…..artsy – very……! Love the eyes especially! That’s a doozy there, Stu! Looks great, nicely done! The flowers bring out the purple in you. Purple???? Better see the vet, pronto. Elsa wants to ask you out, but knows Kyla has your heart. Elsa thinks you are so studly! You are getting better looking each day. Fantastic photo! We love it. Cute picture, Stu! Was She saying treat? Because you look very interested in something! Happy Wednesday!